Edutainment technology increases the use of digital presentation in the classroom. I recently met a History teacher during a school visit who bemoaned the IWB in her classroom, hasn’t been trained on it and in short doesn’t really use it but, as I observed during her break time, does use (indeed dominates) the Android smart mobile device in her pocket manipulating the most creative messaging apps without a second thought and sharing images and text with friends as if she was a born digital native (which, by virtue of her age, she isn’t). So why then is the prospect of firing-up the Interactive White Board in her classroom and using it as support to her lessons such a trial to her? I believe the answer is that for all the benefits of IWBs, and in comparison to their predecessors chalk and ink markers they do deliver considerable lesson presentation benefits, their appearance is closer to ink marker boards than to smart devices so they start with that disadvantage for resistant teachers because they don’t look as if they are capable of the multi-colour, multi-media presentation that they actually are. 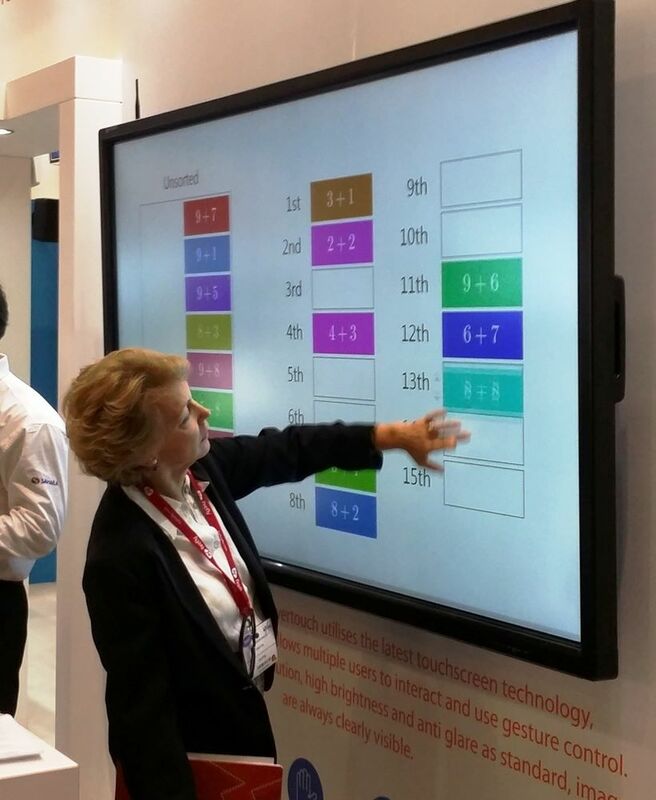 But the new technology of Interactive Flat Panel Displays, which are rapidly replacing IWBs in schools across the EMEA, are a very different kettle of fish. IFPDs look like super-sized smart devices, identical to iPads and the plasma or LED televisions at home. In other words, they look very familiar. Consequently we are now seeing teachers who were hesitant or resistant to approaching IWBs going straight up to an IFPD and without a second thought touching the on-display icons and starting to teach. This wider acceptability will transform classrooms where their IWBs have been mostly used as post-it note stations and where the trainers of the IWB providers are still booked to come in and do their stuff. Training on IFPDs is far less necessary than with IWBs because their use is so much more fluid and intuitive to teachers and because they are so familiar in the way they look and operate to users of smart handheld devices. The other feature of IFPDs that appeals to teachers is their edutainment value. Where IWBs were two dimensional, IFPDs in comparison are multi-dimensional and multi-touch so they are a lot more exciting and entertaining to work with and to create lessons on. In fact this combination of education and entertainment, which we call edutainment, is helping teachers take their subjects to new and more engaging levels. And that's a very welcome development. I predict that where IWBs often have a usage factor in a low tech school of around 50%, IFPDs will take that percentage through the roof close to 95%. And that’s good news for everyone in education.